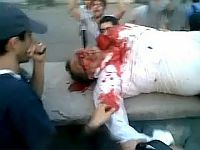 TEHRAN, Jun 21 2009 (IPS) – The political crisis that broke out over the Jun. 12 elections entered a new stage here Saturday afternoon as the government’s security forces moved aggressively – and sometimes with lethal force – against demonstrators throughout Iran’s capital city. Saturday’s clashes, which began in earnest in mid-afternoon as protestors tried to gather at what has become their central rallying point at Enqelab (Revolution) Square, came one day after Iran’s leader, Ayatollah Ali Khamenei, announced in no uncertain terms that he would not back down from his support for President Mahmoud Ahmadinejad and will hold responsible the leaders of the Green Protest Movement – now the effective title of the demonstrations that have engulfed the country – for any violence that might ensue. As thousands of people moved from all directions towards the Enqelab, they were met by uniformed Basij, Sepah (Revolutionary Guards), and special riot police forces at key intersections in a show of force that appeared designed more to frighten and intimidate the population than to secure the civil peace. Around 4:00 p.m., the police closest to Enqelab told marchers that the square had been closed and that they should move toward Azadi (Freedom) Square. But as the crowds inched their way in that direction, they encountered fellow demonstrators coming from Azadi who told them that it, too, had been closed to demonstrators and that police had directed them to Enqelab. The idea seemed to be to keep people dispersed and confused somewhere between the two squares, perhaps an apt, if ironic, metaphor for the itinerant state of the people of Iran in the past 30 years. Still, people who were determined to reach Enqelab continued their path and were faced with the first attack by a relatively large number of Sepah Special Forces who launched tear gas canisters at the crowd, and began indiscriminately beating stragglers with batons, kicking men and women, and even throwing stones. Similar attacks were also reported in metro stations and on the numerous pedestrian bridges that exist in the city of Tehran. People were running into houses, seeking protection from homeowners who had opened their doors. Protests continued at least until 9 p.m., with Iranian state television reporting a total of 13 deaths, while state radio said 19. There is no doubt that there are many more injured and arrested. Without a functioning mobile and text messaging system, accurate information has become impossible to come by. Rumours are flying furiously. One protestor, for example, swore that he had seen with her own eyes former Prime Minister Mir Hossein Moussavi, whose candidacy sparked the Green Protest Movement and who Saturday vowed to continue pursuing non-violent protest until the election results were annulled, wearing a shroud close to Enqelab Square. In his statement, Moussavi explained that he had decided against meeting with the Guardian Council to press his claims of election fraud in light of Khamenei’s speech at Friday’s Prayers, which both accepted the official results of the election and acknowledged the possibility of only minimal electoral tinkering. The other reformist candidate, former Parliamentary Speaker Mehdi Karrubi, also decided against meeting with the Council. Instead, Moussavi called for a full investigation by an independent body. Meanwhile, Iran’s television and radio stations are broadcasting news about nameless people arrested in the current turmoil. The detainees, according to these reports, have confessed to being members of Mojaheddin-e Khalq, an Iraq-based dissident group that is widely unpopular due to its alliance with Saddam Hussein during the Iran-Iraq War. The official media also claimed that many of those arrested had confessed to joining the demonstrations after being contacted by individuals in Britain who allegedly asked them to go into the streets and vandalise property and burn buses. Britain has become a favoured scapegoat of the regime during the current crisis, no doubt because of its constant intervention in Iran’s internal affairs during the first half of the 20th century, culminating in the overthrow – with help from the U.S. Central Intelligence Agency (CIA) – of former Prime Minister Mohammed Mossadeq and the restoration of Reza Shah Pahlaevi. At this point, most people here appear stunned by the latest turn of events and are reacting to incidents and reports of incidents as they occur. Many people here believe that the Green Movement, the likes of which has not been seen since the 1979 revolution, cannot be stopped. Others see a major and ominous difference between the current situation and the events of 30 years ago – that is, the strong will of the hard-liners who currently control the State’s security forces to use all means to suppress dissent. In their view, the Shah’s regime, despite its bad name, was less determined. With Khamenei’s words Friday and Saturday’s popular reaction, the Green Movement appears to have entered a new phase in which its growing number of adherents see the highest authority in the land as the main obstacle in the historic struggle for the rule of law and a just order in Iran. They also see Khamenei himself as having chosen partisanship over guardianship of the constitutional order as his institutional position demands. At this point the challenge that began with election results, even if it ends with a defeat, has shaken the foundation of the institution of vali-ye faqih or supreme jurisprudent. And a shaken foundation makes a downfall a not-too-distant possibility. If Khamenei does not soon realise how the popular tide has turned against him, he may yet go the way of the Shah. *Yasaman Baji is the pseudonym of a journalist writing from Tehran. Copyright © 2018 IPS-Inter Press Service. All rights reserved.